A Mobile Phone Blog: Another new RAZR! They are questioning the need for another RAZR, and some might say quite rightly. While the phone has been one of the iconic designs of the noughties, perhaps it is time for a manufacturer of Motorola's resources to move on to something fresher. After all, the other firms have created equally stylish variations on the theme, such as LG's Chocolate and the swathe of folding Nokia phones recently released onto the market. What will be the next big step forward in phone design? 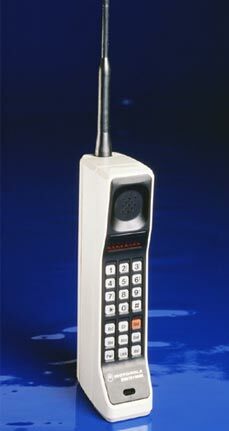 I'd like to suggest the return of the huge, Graphite-stlye phone. With retro styling taking over everywhere we look (notice girls in leggings and pumps, boys in skinny jeans), isn't it about time that we all had phones the size of bags of sugar?